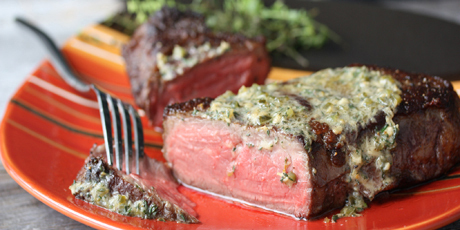 Succulent, large sirloin steaks lathered in a creamy horseradish butter. 1. In a small bowl, cream the butter with the relish, Worcestershire, thyme and horseradish until everything is smoothly combined. Place a piece of plastic wrap on your work surface. Scoop the butter along the edge, forming a log shape roughly 4 inches long. Roll the butter once so it is nearly covered in the plastic wrap, then gently roll further. Tightly roll up the plastic wrap, grasp the ends of the plastic and twirl the works a few times, tightening the butter into a perfect round log. Alternatively place the butter in the bottom of a resealable plastic bag and repeat the same steps to form an even log. Refrigerate or freeze for several hours or overnight until the butter is firm enough to slice. 1. Season the steak with salt and pepper. Heat a skillet over medium-high heat and add the butter, swirling to coat the pan. Once it begins to sizzle add the steaks and begin searing their first sides until they’re crusty and caramelized, about 8 to 10 minutes. Adjust the heat as needed high enough to keep the steaks sizzling but not so high as to burn the butter. Flip the steaks and cook the other sides for another 6 to 8 minutes for medium-rare. To judge whether the steak is done poke it with your finger; it will firm up as it cooks through. Serve with a slice of horseradish butter melting on top.